The first thing I do in preparation for a cabinet restoration is to strip out the motor board, playfield and light board. If it is having a full repaint, everything else is also removed until all that is left is a bare cabinet & back box. Next I inspect all the joints. They are well made but the old vegetable glue has often failed. Any bad joints or loose braces are cleaned, glued & clamped. When I am happy with the cabinet structure, I carry on with any repairs required to damaged corners, deep scrapes and any other damage. Then, if it only needs touch ups, I do those. If it needs repainting, I take tracings of the original art if it exists. If it has already been repainted, I strip any later coats off to reveal enough of the original art to make traces. 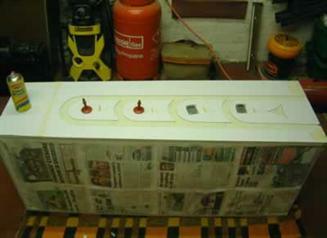 Then I sand it all back to bare timber, including the inner faces that are seen above the playfield. Then fine repairs are done. When the cabinet and back box are ready, I mask out the base. 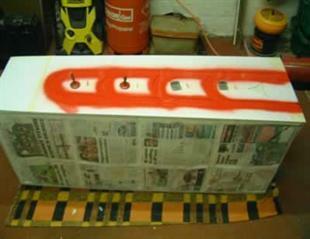 Then it all gets two coats of primer. That is sanded and then two coats of the base colour are added. Any webbing or spatter is then added. Templates for the art are then made from the tracings, and the coloured art is applied, in the same order the factory did it. 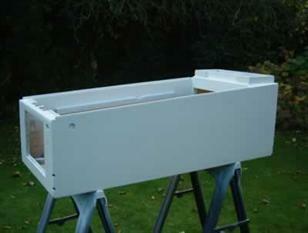 The boxes are then set aside for the paint to harden. The playfield is next. 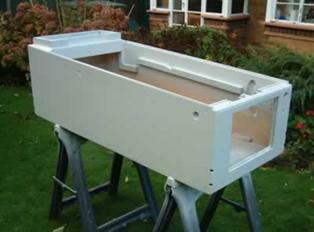 It is stripped of all top components and thoroughly cleaned. Any touch ups are done, if needed. It is then polished with two coats of Carnauba paste wax. Any metal screws and other small parts are polished by hand or in a parts tumbler, or replaced with new ones. All plastic posts are ultrasonically cleaned. Playfield plastics are cleaned & polished by hand. I replace any tired plastic parts with new or good used. All the inserts are cleaned from below. 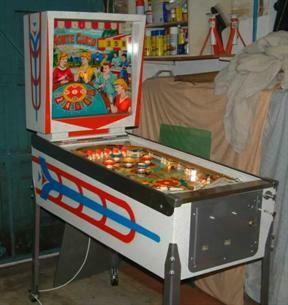 Then the playfield is rebuilt with new Mylar circles under the pop bumpers and a new rubber ring kit. The back glass is inspected, sealed to stabilise it (if needed) and any touch ups completed. 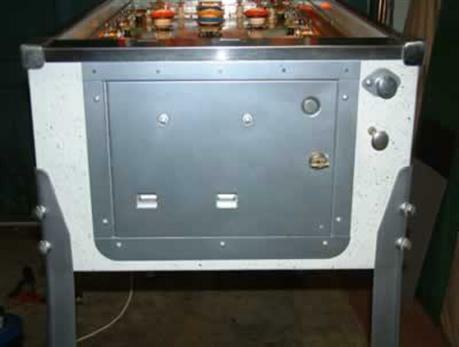 Larger metal items such as legs, coin doors, coin bars are either cleaned & polished or replaced. Any ball lifter and the ball shooter assemblies are stripped, cleaned and polished. The game can then be rebuilt. New leg levellers and bolts are used. Side rails (if removed) are re fitted with new, (as original) twist nails. The game is now looking as good as it ever will. As it has recently been electro mechanically gone through, it is also playing as it did when new. With all the lamps working, it also glows as it should. Having the game lit correctly is important, it is one of the really appealing aspects of EM pinballs. They look fantastic when lit up in a darkened room. There is nothing worse than a game where the lamps are dimming or not working. 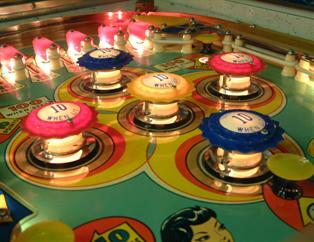 If a playfield feature isn't lit, it is not possible to play a game properly. There is no way of knowing what stage game play has reached. I make sure all my games have every lamp working as it should. 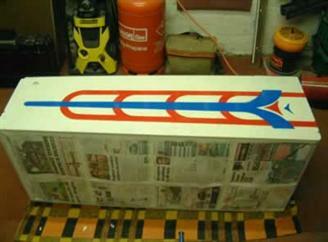 Left - paint stripped to the base coat for tracing. Centre - sanded to bare timber, faults repaired. Painted and finished. Original paint revealed, I got a trace from this. Cabinet in primer. Cabinet in white. Finished. Looking good. 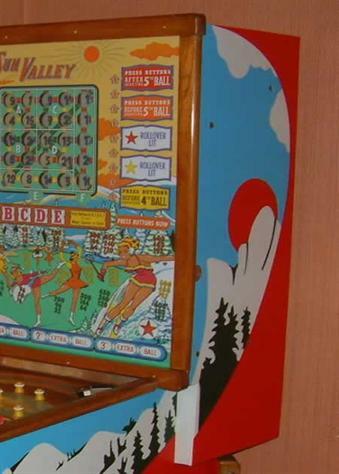 The playfield turned out very well indeed. 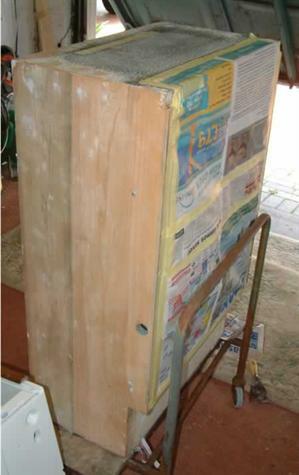 An example of a cabinet that has been touched in. The damage was filled & sanded and the art touched in to match the existing colours. The blue colours on both cabinet images are actually the same, it's my cameras colour balance that makes them look different. 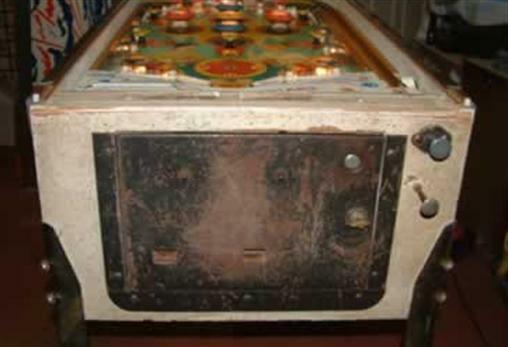 If you have a vintage pinball game you'd like to keep, but it doesn't work or look like it once did, contact me. I've got years of experience and I absolutely enjoy doing it. I can restore your game so it looks and plays as new. The restoration of a game can take many forms. Anything from the simplest job just to make a game look acceptable without major alterations to the cosmetic condition, or a restoration which keeps as much as the games originality as possible, but includes cosmetic improvement to those areas which are damaged, worn out or missing. Original replacement components are used wherever possible,and the game keeps its original appearance. 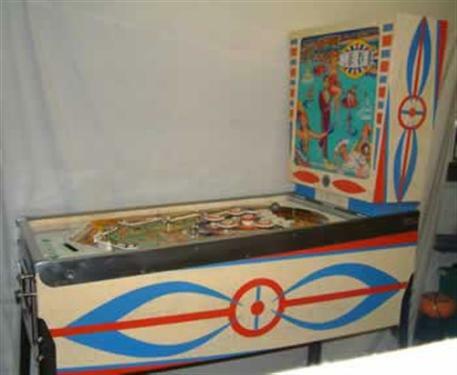 Then, there is the full restoration, where the cabinet has considerable touch up work, or is completely repainted, the playfield touched up or refinished, or even replaced. The same with the back glass. The condition of all these will determine what is needed. The game will be completely gone through electro mechanically, having every component stripped, cleaned & rebuilt with new parts as required. The score reel drums (if fitted) and replay drum will be cleaned & polished. 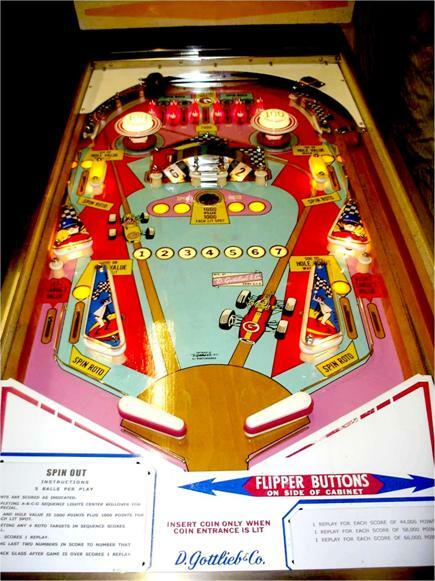 The flippers, slingshots, pop bumpers and any other playfield features will be totally overhauled. 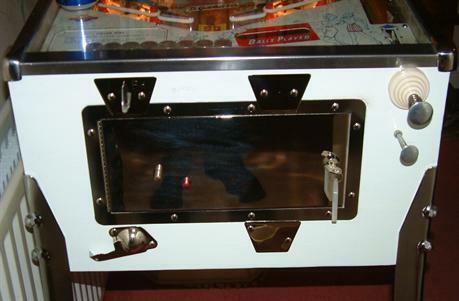 The game will have a new three core mains lead fitted, and the transformer chassis, on/off switch housing, coin door and lock down bar will be earthed for safety. The game will then be blown clean with an airline to remove all dust, old bits of solder and all other debris. Any loose labels will be re fixed on the correct component. 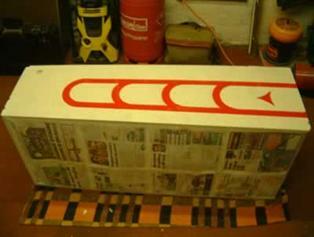 NOS or reproduction score / instruction cards will be fitted. 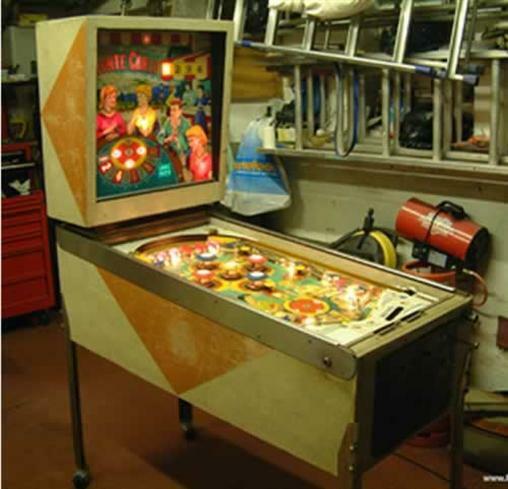 A new playfield glass will be fitted if the existing one is not tempered, is badly scratched or missing. Any steel components will be refinished as original or replaced with reproduction items. New leg levellers, leg bolts and replacements for any other missing bolts will be fitted. The game should then play as new, and look either very nice original or as near new as it can. All games are repainted using the factory method. Stencils are made from tracings of the orignal art (this is usually under any repaints already done, and can be revealed clearly enough to trace), and Cellulose paint is used, as original. I can restore your old and tired game to any condition you require. Whether it be a light restoration to make it look better, or a total refurbishment to as near factory original as possible. Contact me for a chat about what you require and an estimate of what it will cost. 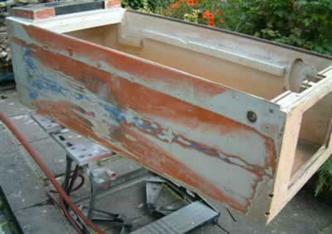 Here are before & after pictures of a 1963 Bally Monte Carlo. It was filthy dirty from thirty years of storage and didn't work properly when I got it. It also had the wrong cabinet art. The top bar of the door frame was missing, a new one was fabricated and fitted. Now it looks near new and plays as it did when it left the factory. 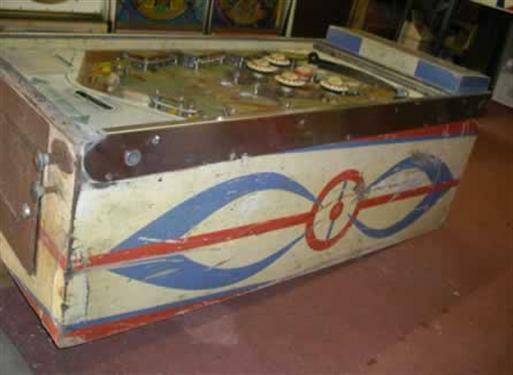 A playfield with the top and bottom apron assemblies removed. All lane guides and posts, plastics, posts and post screws, pop bumpers and all other components have also been removed. The flippers will also be taken off. It can then be properly cleaned everywhere (including the areas not normally seen), touched in (if required), and polished. The ball shooter lane will also be thoroughly cleaned and polished. All the switches which protrude through the playfield will be cleaned and gapped. 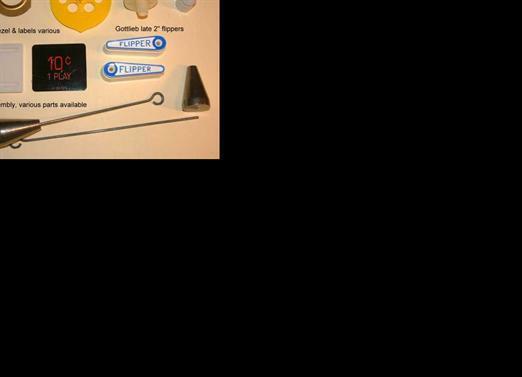 Then the plastic components, which have been ultrasonically cleaned and polished, and screws and other metal items, which have been tumbler polished, can be re fitted. The plastics will be hand cleaned and polished. New lamps will be fitted as required. The pop bumpers will have new loose protective Mylar circles fitted, as original. They protect the surrounding art from ball damage as it it forced away. Reproduction, good used, or NOS parts will be used, as dictated by the type of restoration. A new rubber ring kit with shooter tip and rebound rubber will be fitted. The apron assemblies will be hand cleaned and polished before being refitted. When it is completed, the playfield will shine superbly and allow the ball to move around it at the speed it was originally designed to. This is the sort of attention to detail which takes many, many hours, but makes a game play properly, as it did when it first left the factory. A new ball will be installed to ensure the playfield is protected from premature ball wear. 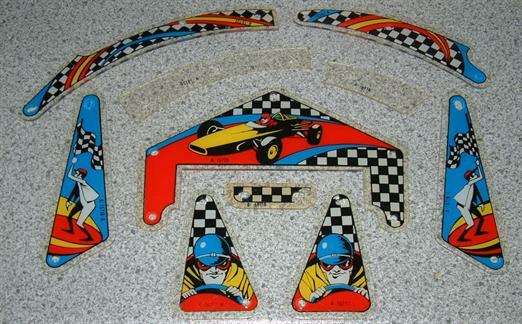 Reproduction parts that will be fitted to above playfield. Cleaned and polished parts that will be re used on the above playfield. The post have yellowed a little, some more than others. The more yellowed posts can be used in locations where they are not seen. I could have used new reproduction posts, but they are a grey white colour and would not blend in so well. 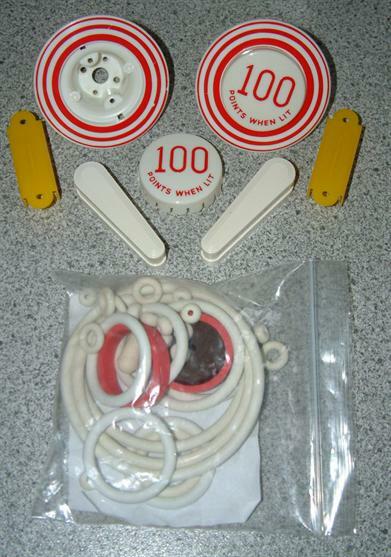 A new old stock plastic set. I was very fortunate to locate this set. NOS sets are very rare, and no reproduction set is currently available for this game. Two of the old plastics were cracked, they had all faded a little. I could have repaired the old set, but these will make this game look so much nicer. 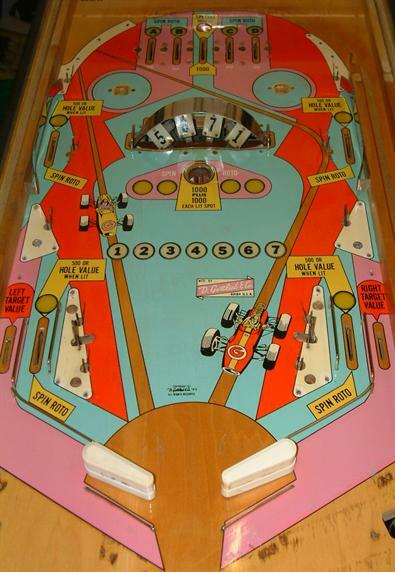 The playfield, rebuilt with the parts shown in the images above. Everything now shines beautifully and the game is playing as new. All the metal parts sparkle and the NOS plastics and new pop bumpers have bright, strong colours. 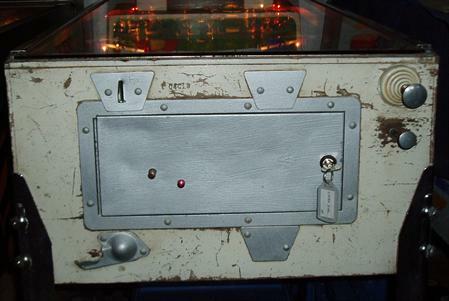 The circles around the pop bumpers have had loose clear protective rings fitted, as the game originally had. A brand new rubber ring kit has been fitted. This includes the correct red flipper rubbers, the rebound rubber and a new white shooter tip. The top and bottom aprons have been cleaned & polished. All the lamps work as they should, with all the inserts lighting when they should. New reproduction score & instruction cards have been fitted, and are covered by clear acetate sheet, to keep them clean. 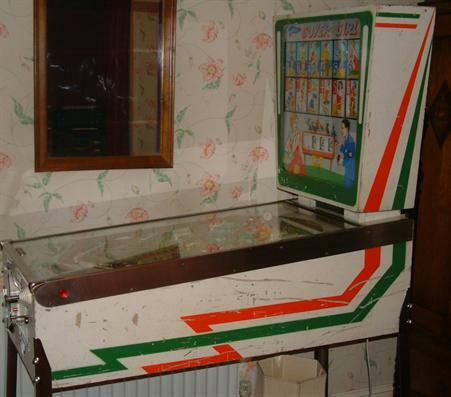 This playfield will stay like this for many years, as long as it is given a regular waxing. Another cabinet that has been touched in. 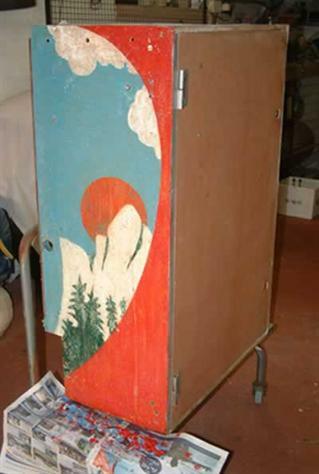 The paint was badly scratched from the machine being dragged againt other games, doorways and other unknown objects. There were no deep gouges or lumps missing, so it could be done. It will never be as perfect as a repaint, but a game is only original once. The front of the game above. It arrived looking very sorry for itself. The coin door was dented and had been coated with Hammerite! The front was stripped, cleaned & touched up. A new coin door, frame & bolts were fitted. I had the coin blanks, slot and return polished and Nickel plated to match the door. The coin slot is marked for 6d (sixpence), I always try to keep original metal coin bars marked for original UK coinage if possible. They are not available as reproduction items. The cast alloy lock down bar end caps were replaced and the bar polished. The ball lifter & shooter rods were polished. The beehive housing was cleaned & polished. The game now looks near new again.